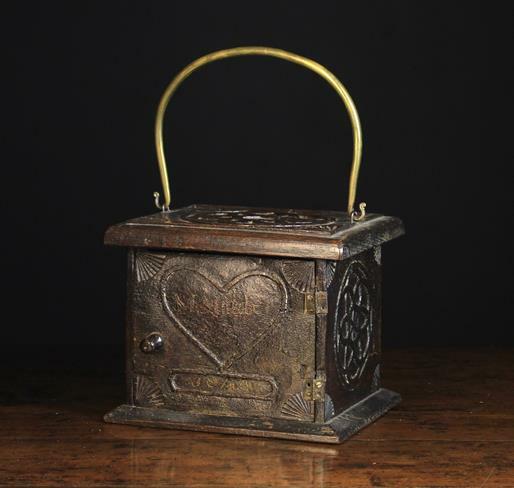 A 19th Century Dutch Carved Oak Warming Box. 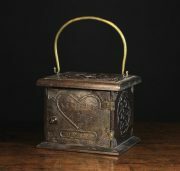 The 9 inch x 8 inch (23 cms x 20 cm) top having a moulded edge, fretted daisy design to the centre and fanned corner motifs with a brass swing carrying handle. The sides and back board repeating the design in blind fret-work. The hinged front door with peg handle painted with the name M MULDER in a heart above the date 1844. 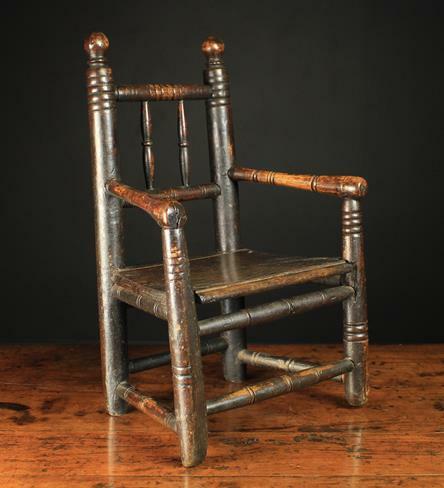 A Late 18th/Early 19th Century Child's Miniature Turned Spindle-backed Armchair, 19 in (48 cm) high, 12½ in (32 cm) wide, 9 in (23 cm) deep. 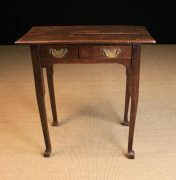 A Small George II Shropshire Oak Side Table. 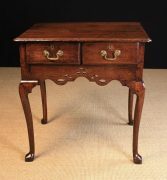 The rectangular top above with two small frieze drawers standing on square stylised cabriole legs with outswept feet, 26½ in (67 cm) high, 27 in (69 cm) wide, 16½ in (42 cm) deep. 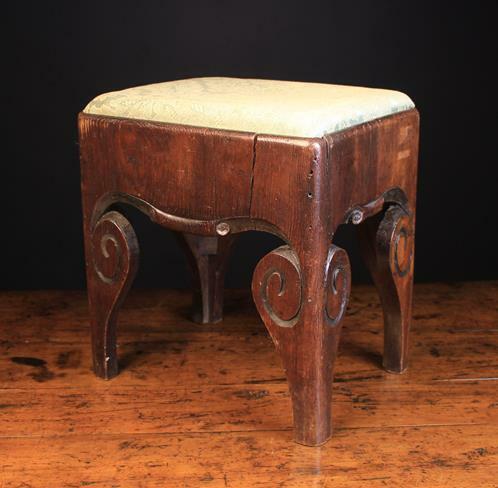 An Unusual Early 19th Century Oak Stool. The padded rectangular drop-in seat on a shaped base carved with voluted scroll sides. 15 in (38 cm) tall, 13 ½ in (34 cm) wide x 10 ½ in (26.5 cm) deep. 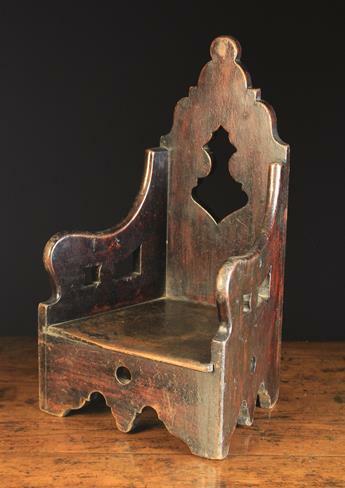 An Unusual Early 19th Century Scottish Boarded Mahogany Miniature Child's Armchair. 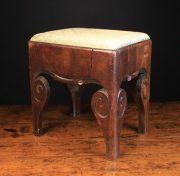 The tall shaped back, angled armrest sides and apron boards pierced with decorative motifs and bearing a slot in plank seat, 21½ in (55 cm) high, 12 in (30 cm) wide, 10½ in (27 cm) deep. 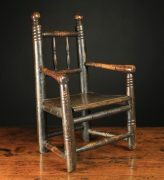 A Small Late 18th/Early 19th Century Joined Oak Welsh Armchair. 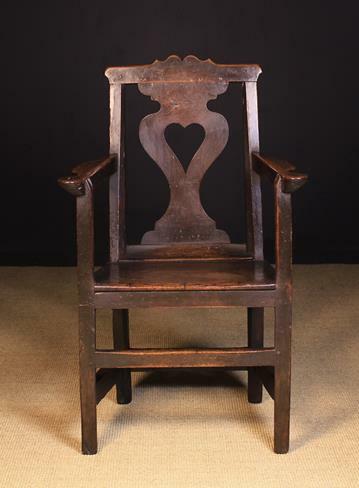 The cresting rail above a broad shaped centre splat pierced with a heart and flanked by chamfered uprights. The arms with outswept pad terminals on square uprights leading down to a plank seat and square legs united by stretchers, 32½ in (83 cm) high, 23½ in (60 cm) wide. 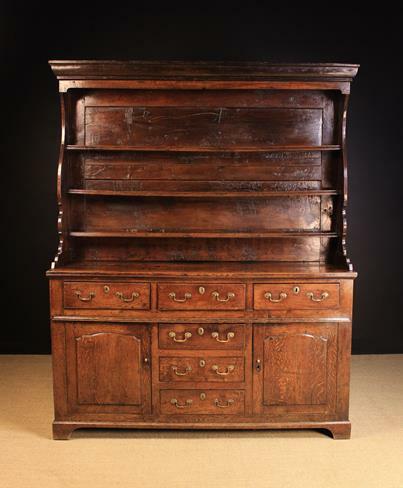 An 18th Century North Wales Oak Dresser of good colour & patination. The rack having a moulded canopy on shaped side planks flanking three shelves with applied edge moulding. The base housing three frieze drawers above a bank of three central drawers flanked by doors with raised edge-moulded panels. The drawers fitted with brass swan-neck swing handles and oval escutcheons. Standing on bracket feet, 81 in (206 cm) high, 64½ in (164 cm) wide, 20½ in (52 cm) deep. 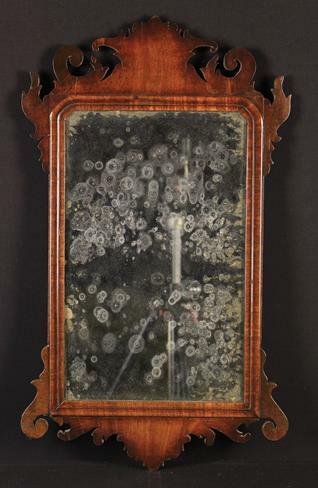 A Small George II Red Walnut Wall Mirror with a moulded border and scrolling silhouette cut pediment and base, 26¼ in x 15½ in (67 cms x 39 cm). An 18th Century Oak Lowboy. The edge moulded top above a shaped apron housing three lip moulded drawers with mahogany cross-banding and brass swing handles on winged back-plates embellished with punchwork. 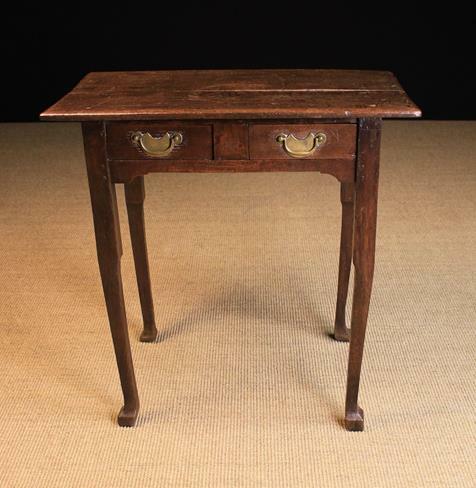 Standing on round turned legs with raised brackets adorning the hips, tapering down to pad foot terminals, 27½ in (70 cm) high, 29 in (74 cm) wide, 18 in (46 cm) deep. 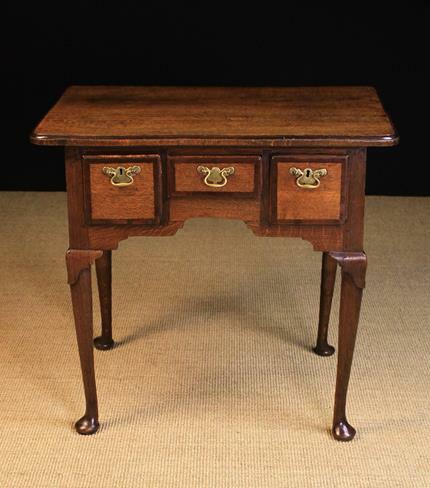 An Attractive 18th Century Oak Lowboy. 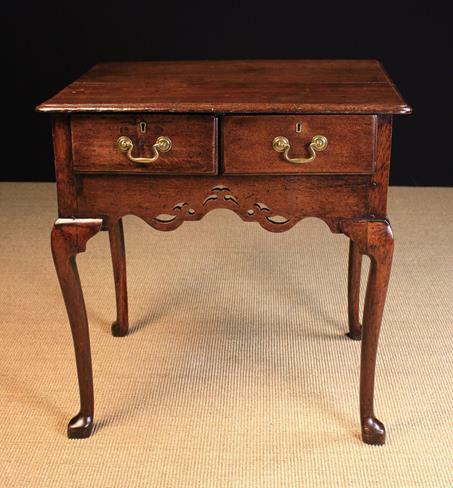 The top having a moulded edge above two lip-moulded drawers set in a decoratively pierced serpentine edge apron, and raised on cabriole legs with pointed pad feet, 28½ in (72 cm) high, 27½ in (70 cm) wide, 21½ in (55 cm ) deep.